At the stroke of midnight Sunday, women in Saudi Arabia got behind the wheels of their cars and drove in the streets of the conservative capital Riyadh, a daily mundane act everywhere else but here. They marked the historic end to a ban on women driving, the culmination of more than three decades of activism. Traffic policemen were photographed handing out roses to female drivers,an extremely unusual act in a conservative, gender-segregated society where strict rules govern male-female interactions. While some women had been trepidatious about driving as soon as the ban lifted, preferring to wait and see how it goes, the first hours of Sunday in Saudi still saw an enthusiastic number of women driving. One woman even reportedly got a speeding ticket, seemingly fitting in nicely with her countrymen's taste for speed. Her husband playfully reported on Twitter that his wife was probably the first woman to be fined for speeding, driving 70 in a 55mph zone. The tweet has since been deleted. Yet not every woman who’s been eager to drive was able to today. Some of the women who have been advocating for decades for this very right were still in jail after being detained at the end of May. They were not forgotten in this historic moment though. Fellow activist Manal al-Sharif, who lives in exile, tweeted announcing a new campaign channeling the miles women will now be able to drive, to obtain the release of the detained activists and continue to push for the end of male guardianship laws, the next frontier in women empowerment in Saudi Arabia. Excitement has been steadily building since the King announced the lifting of the ban on women driving last September. Over the past few months, women have enthusiastically gone to auto shows specifically geared to them, signed up for driving lessons and traded in their foreign licenses for Saudi ones. Pictures of women proudly holding their licenses have abounded on social media and have made the cover of one of the leading Arab women’s magazines, Sayidati. Many Saudi women drive abroad, including in neighboring conservative Arab countries like Bahrain or the UAE. As such, 21 centers were set up to exchange foreign-issued driver licenses for Saudi ones across the provinces of the Kingdom. And the first licenses were delivered at the beginning of the month. The world’s most profitable oil company, Saudi Aramco, employing more than 60,000 people in the kingdom and running city-sized compounds set up a driving school to train thousands of its female employees and female descendants of its employees. One of those brought in to oversee the effort is California driving instructor Norma Adrianzen, who moved to the eastern Saudi city of Dhahran two months ago, along with a Canadian and a British colleague. She has found her Saudi driving students exactly the same as the students she teaches in California, except for one difference, they are very cognizant of the historic nature of their undertaking. “I really felt it became real for them the day they applied for their licenses. They all went quiet in the room, it was surreal and very emotional” Adrianzen told ABC News. The ages of the students at the school range from 18 to 50, some already drive abroad, others are first-time drivers. It hasn’t been all smooth sailing though. 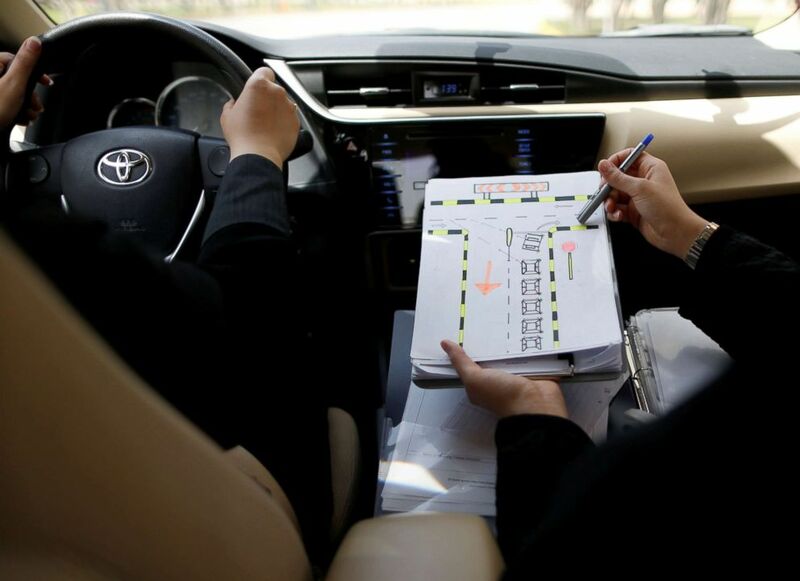 On June 19, a news item circulated on Saudi Twitter saying that in the eastern province of Saudi only 67 out of 13,000 female candidates passed the driving tests required, drawing the ire of some in the hyperactive Saudi Twittersphere. ?????? ????? ?? ????? ?????? ???????? 13000????? ?? ???????? ??? ????? ???????? ???? ???? ???? ??????? ??? ??? ?? ?????!! Yet this change has come at a steep price for others. The activists who had become the faces of the decades-long struggle to secure the right to drive were abruptly detained at the end of May. Though they had seemingly contributed to bringing about that change, the had quickly moved on to advocate for an end to the male guardianship law that compels women to seek the permission of their male relatives for traveling, conducting official business or undergoing certain medical procedures. They had also recently started advocating for victims of domestic violence. 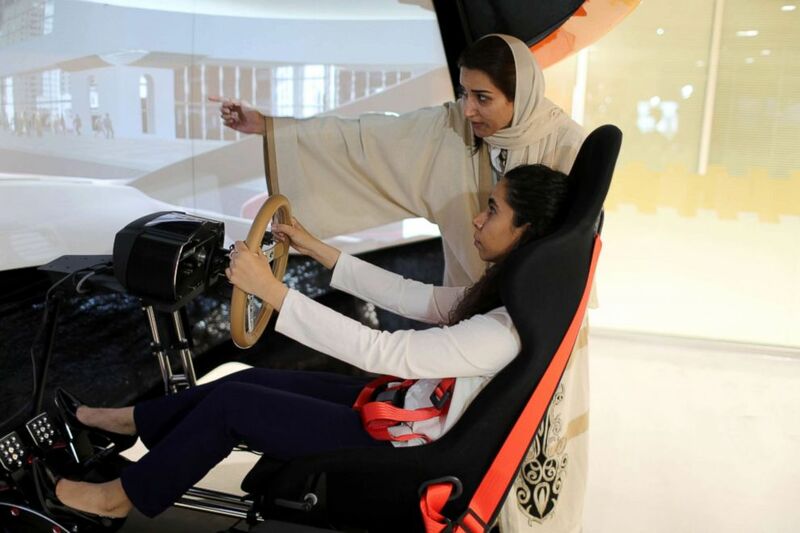 A driving instructor teaches trainee Maria al-Faraj during a driving lesson on a 3D screen at Saudi Aramco Driving Center in Dhahran, Saudi Arabia, June 6, 2018. Their advocacy may not have played in their favor in a deeply patriarchal country, in a country still ruled by an all-powerful monarch, where political dissent is not tolerated. Four women and five men are in custody after being referred to the Specialized Criminal Court to be, per Saudi paper Okaz, all for allegedly conspiring against the national security of Saudi Arabia on behalf of foreign entities. A driving instructor teaches road signs to trainee Amira Abdulgader during a driving lesson at Saudi Aramco Driving Center in Dhahran, Saudi Arabia, June 6, 2018. And in recent days Human Rights Watch reported the arrested of two additional female activists who had publicly decried the earlier arrests. The arrests puzzled many who had been enthused by the social reforms put in place by the powerful young Crown Prince. He is seen as the impetus behind the lifting of the driving ban as well as the return of cinemas to the kingdom and a relaxing of gender segregation in the workplace. Nevertheless, Twitter has been alight with comments using a hashtag that translates to #Women_Driving_Cars. Some, like prominent Saudi television journalist Muna Abusulayman tweeted lyrics from The Pointer Sisters 1980s hit “I’m so excited." And I know, I know, I know, I know, I know I want it"#Saudi_arabia #saudiwomen #driving #?????_??????_??????? I’m actually quite anxious about all the women driving in a few days. Not because women can’t drive or any nonsense like that, but because there are many new drivers who will all be out on the roads all of a sudden. #?????_??????_??????? Some, mainly men, poked fun, tweeting memes showing children and a husband fighting over the backseat. Or tweeted sexist advice urging women not to “put makeup while driving." Though some men were supportive, even pointing out how dismal and dangerous Saudi male driving is. “Seeing a lot of commentary ridiculing and fear-mongering about women driving, but I’d like to show you a video I shot this morning from my car, this is how men drive, women won’t be worse!” one Twitter user wrote. In addition to setting up driving schools, and driving simulators, a special parking section for ladies only has already been set up in one of the most popular shopping malls in the conservative capital Riyadh. ???? ????? ??????? ?? ?????? #?????? ????????? ?? ??????? ?? ??????? ? ????? ???? #?????_??????_??????? Some slots formerly reserved for disabled drivers have been superseded by a newer pink stamp in the shape of a woman. ?????? ??? ??????? ????? ?????? ?? ?????? ???????? ????? ?????? ???? ????? ?????? ??? ??? ????.. The lifting of the ban has garnered worldwide attention, even making the cover of The Economist. This week’s issue declares “The Saudi revolution begins” over a black shape meant to depict the strict black full body veil imposed on women, with a race car instead of the eyes. Yet, another US-based Saudi artist, singer-songwriter Tamtam released a song this month called “Drive,” to mark the lifting of the ban. Singing “we know what we want, we know it’s our time, let go of past perceptions, tomorrow is mine, we got drive, pushing through the limits, we ride," she encapsulates what this historic day represents for Saudi women as well as the road still ahead.